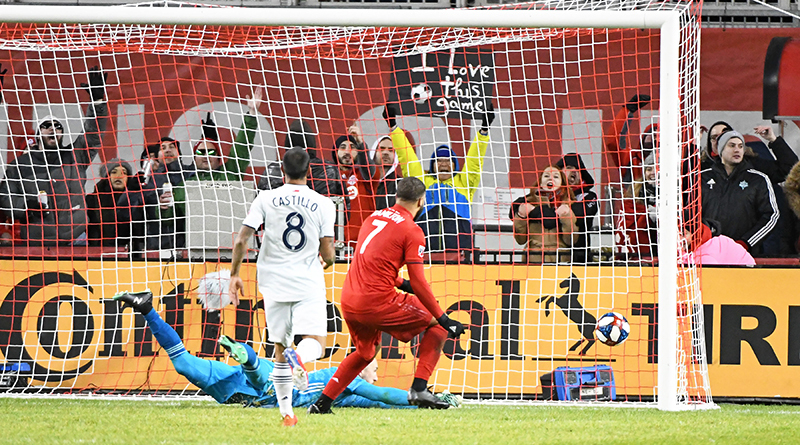 In the 45th minute of the MLS Week 3 encounter between Toronto FC and New England Revolution, Toronto’s Ayo Akinola passed to Jay Chapman, who subsequently crossed the ball into the penalty area leading to Toronto’s second goal. This has been the subject of much discussion, due to the fact Chapman was clearly in an offside position when the ball was passed to him. However, as many will have realized, the attempt by New England Revolution’s Antonio Mlinar Delamea to intercept the forward pass is, according to guidelines issued by The IFAB and FIFA, an example of a deliberate play on the ball by the defender. Therefore, using the Laws of the Game and these considerations, in the situation from Sunday’s game the New England defender was correctly deemed by the officials to have deliberately played the ball. As this was the last touch before Chapman received the ball, Chapman was correctly no longer judged to be either in an offside position nor gaining an advantage from being in an offside position. The outcome would have been different had the ball hit Delamea and bounced or rebounded off him, in which case Chapman’s offside position at the moment the ball was played to him by his teammate would have been penalized. However, Delamea’s deliberate action negated Chapman’s offside position. Ultimately the goal by Jordan Hamilton was legitimately allowed to stand to give Toronto a 2-1 lead at this point in the game.